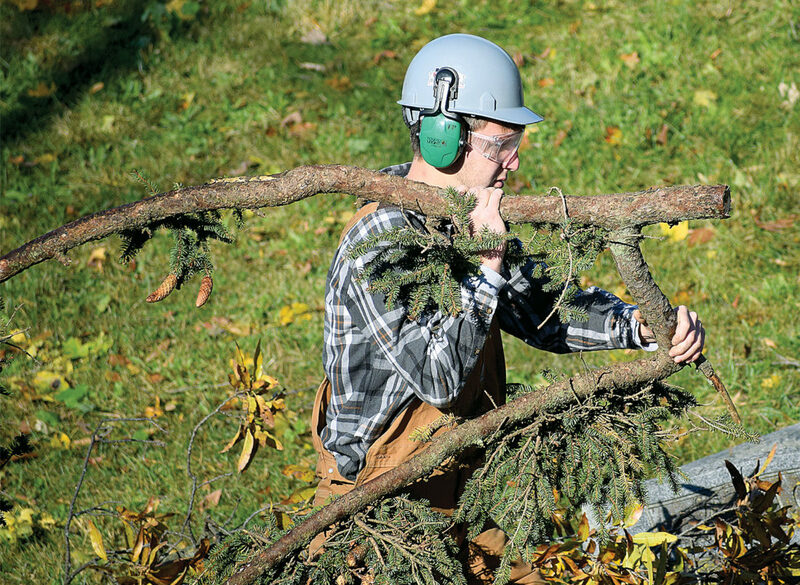 PHOTO BY JILL GOSCHE Matthew Cole, a senior in Sentinel Career and Technology Center’s building trades program and at Columbian High School, carries a branch at Greenlawn Wednesday morning. Sentinel Career and Technology Center students and staff provided help in a time of need Wednesday. 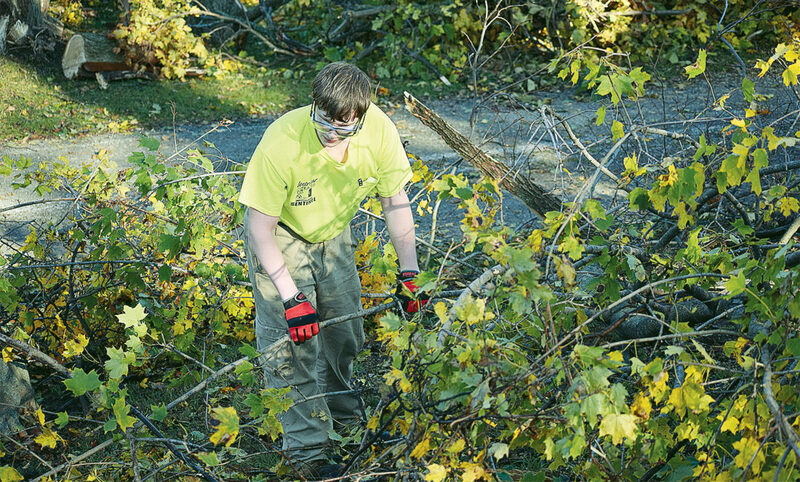 About 160 students helped at Greenlawn Cemetery, which suffered downed trees during Sunday’s storm. “Community service is a huge part of what we do,” said Derek Lewis, assistant director of Sentinel Career and Technology Center. Lewis said officials saw the cemetery needed assistance. The school is able to take students to those kinds of projects, he said. “We’re fortunate. … (Instructors) all said, ‘Absolutely,'” he said. PHOTO BY JILL GOSCHE David Compton, a senior in Sentinel Career and Technology Center’s electrical trades program and at Upper Sandusky High School, helps clean up brush at Greenlawn Cemetery Wednesday morning. Seniors helped at the cemetery in the morning, and juniors helped in the afternoon. Programs represented included electrical trades, building trades, independent living, automotive technologies, collision repair, precision machining and welding. Students will return to help if cemetery officials need them, Lewis said. “They’re grouped up by program,” he said. In addition to students, Sentinel provided a dump truck, a van with a trailer, a Gator and six chainsaws. Angela Miller, a senior in Sentinel’s collision repair program and at Old Fort High School, said the service was good for the community. Students were showing they care, she said. “We’re at least doing something,” she said. Carl Rusch, Sentinel’s collision repair instructor, lives on East TR 148, about 10 miles from the cemetery where he helped Wednesday. He went to his basement during the storm. “We didn’t get any damage. … Sirens went off and everything,” he said. Rusch oversaw collision repair and automotive technology students trim up a tree measuring about 70 feet. The work does them some good, he said. Cleanup at Greenlawn Cemetery after Sunday’s storm has been expected to be a months-long process. Anyone who can donate time or money is asked to call (419) 447-2010.